What material can substitute for aluminium and offer improved strength as well as reduced weight? Is it possible to manufacture components that weigh 50% less than aluminium but offer similar or greater strength? Aluminium is a material commonly used but carbon fiber provides a new solution for many construction engineers. This paper specifies differences between these materials and describes their strengths and weaknesses. What are the strengths and weaknesses of these materials? Read this article to find out more about strengths and weaknesses of aluminium and carbon fiber. Carbon fiber is used in industries where high strength and rigidity are required in relation to weight. e.g. in aviation, automated machines, racing cars, professional bicycles, rehabilitation equipment. Due to its unique design, carbon fiber is also used in the manufacture of luxury goods including watches, wallets etc. This material makes the product unique in the world of luxury and elegance and helps it to be one step ahead of the competition. It is not easy to compare properties of carbon fiber against steel or aluminium. Unlike carbon fiber, metals are usually uniform– isotropic, which ensures the same properties in every direction. Strength and rigidity of a carbon fiber component is created by positioning fabrics in a specific way. 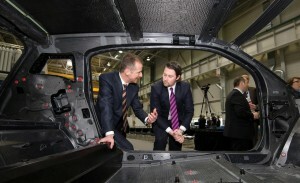 This presents opportunities for the manufacturer but also requires great knowledge and expertise. Rigidity and strength of material in relation to weight. Rigidity and strength of material of the same thickness. Note that any reference to carbon fiber and its characteristics in this paper relate to a composite made from carbon fiber and epoxy resin. To explain rigidity in relation to weight, imagine a slab 5 cm wide, 50 cm long and 2 mm thick. When you suspend a 5kg weight from the end of the slab, the loading will result in bending and the degree of bending will correspond to rigidity. For different materials, a slab of the same thickness will show different bending properties. The stiffer the material, the less bending will happen. After the load has been removed, the slab will resume its original shape. And now imagine that strip of material is exposed to higher loading– that will cause yielding of the strip and following loading release, the strip resumes its original shape. It is strength that makes it possible. The more strength a material has, the more loading it will take before permanent yielding follows. Other than strength and stiffness, another crucial property for design engineers is the weight of an element, which is determined by density. 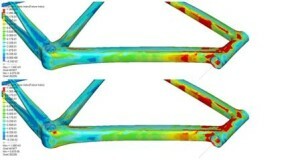 Material stiffness is measured with Young modulus. However this parameter alone is not sufficient to specify material stiffness, without taking into account the weight of the given element. E.g. in the case of a bicycle frame (dimensions, geometry, wall thickness) made from two different metals: steel and aluminium, the steel one will exhibit 3 times more rigidity than the aluminium one. However if we also take into account the weight of elements, then the steel frame, although it has 3 times more rigidity than the aluminium one, it will also be 3 times heavier. These numbers are approximate only as, in practice, a design engineer specifies geometry for the selected material, e.g. 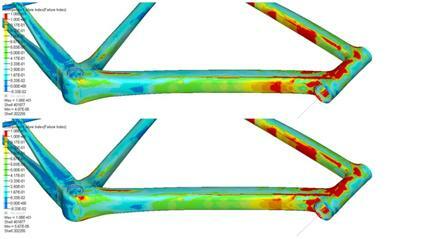 in case of an aluminium bicycle frame most often the frame diameter is increased, as well as wall thickness. In the case of a bicycle frame, stiffness and strength is directly linked to geometry and wall thickness (wall thickness increased x 2 times results in stiffness improved about 8 times). Strength depends not only on the material and the thickness of a section but also on its geometry. Actually there are a lot different factors, but it is the relation of a material’s rigidity to its weight that is the common denominator and simplifies comparison and analysis of different materials. The relation of stiffness to weight (namely a specific modulus) is in practice most effective to determine the rigidity of a material, as for most design engineers, both stiffness and weight are the most crucial parameters. Carbon fiber is a material that offers stiffness and strength at low density– which is lighter than aluminium and steel, that provides many practical benefits. 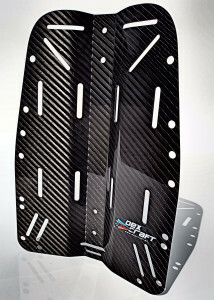 Weight for weight, carbon fiber offers 2 to 5 times more rigidity (depending on the fiber used) than aluminium and steel. In the case of specific components that will be stressed only along one plane, made from one-direction carbon fiber, its stiffness will be 5-10 times more than steel or aluminium (of the same weight). The following tables compare stiffness and resistance to damage for different materials of the same weight. For the purpose of analysis, two-direction carbon fiber was applied – one most often used for manufacture of composites, and one –direction carbon fiber – used occasionally, mostly for products where stress is expected only along one plane. The above data for carbon fiber sheets relates to a sample made using the technology of epoxy resin infusion (70/30% ratio of carbon fiber to resin). The above statement shows many advantages provided by carbon fiber, as well as elements designed and made from carbon fiber. Fabrics of improved and highest modulus relate to special materials (unfortunately very costly) that offer rigidity characteristics x 2 times more than standard carbon fiber, and they are used mostly in military applications and the aerospace industry. To interpret the results shown in the table, imagine that a design engineer is going to construct a strong and lightweight carbon fiber sheet of 1m2 with maximum weight of 10 kg and he considers aluminium, steel and carbon fiber. Steel slab about 1.5 mm thick. Aluminium slab about 4 mm thick. Carbon fiber slab about 7 mm thick. Carbon fiber provides 2 essential benefits. Carbon fiber offers more stiffness (as described above) at lower density and consequently the product of the same weight may be thicker, that will result in stiffness improved by increased thickness alone. To put it simply, material thickness increased x 2 provides rigidity of 23 – so about 8 times more. 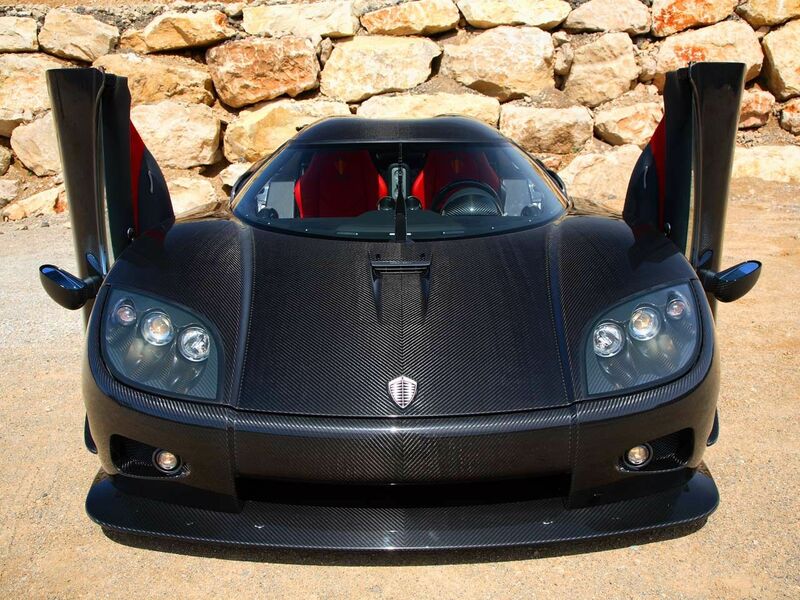 This provides many opportunities with regard to weight reduction thanks to the use of carbon fiber. Very often design engineers look for material that will enable them to manufacture a component identical to an aluminium one in all dimensions– including thickness. The tables below show comparisons regarding the stiffness and strength of a component of the same thickness made from aluminium, steel and carbon fibre. Note that the component made from carbon fiber of the same dimensions will be 50% lighter than an aluminium one and more than 5 times lighter than a steel one. You will find out more in section 3. Weight / density of material. 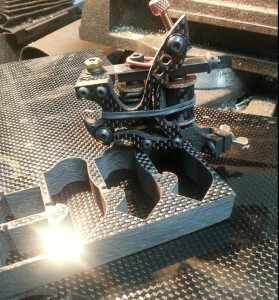 Replacement of aluminium with carbon fiber resulted in this diving backplate weight being reduced by 55% (from 700 to 450 gram). A component made from standard carbon fiber of the same thickness as an aluminium one will offer 31% more rigidity than the aluminium one and at the same time weight 50% less and have 60% more strength. Use of carbon fiber of higher modulus and one-direction fabric may provide x 4 times the rigidity compared to aluminium at similar or improved ultimate strength. Note that, in practice, steel and aluminium have ultimate strength lower than that specified in the table. This is the due to the fact that before total destruction (calculation of ultimate strength was based on this moment) a metal element will undergo permanent deformation (will not restore its original dimensions). The moment when permanent bending occurs (without destruction) relates to yield strength. For the resistance to damage in the above data, the Tensile Strength – Ultimate Strength was applied that relates to resistance to total destruction (cracking). For example, when bending aluminium sheet metal, before total destruction and cracking, the sample will first get broken (without any possibility to restore its original dimensions). Data provided in table relate to totally destructed samples (cracking) with the assumption that bending will cause total destruction (which is not totally correct). 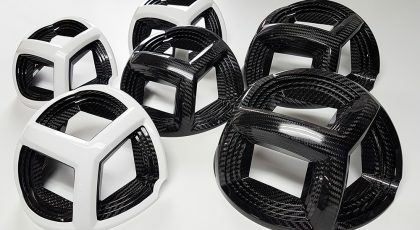 Carbon fiber has different performance – in case of loading that causes permanent bending of aluminium without restoration of the original dimensions, carbon fiber will demonstrate more elasticity and, after momentary bending, will restore its shape following release of the loading (spring back effect). Total destruction of the carbon fiber element will follow suddenly and without any warning – unlike aluminium, which exhibits some warnings related to permanent bending. Always remember the above when designing a manufactured carbon fiber component to provide for some allowance. With regard to interpretation of results in the table, it is evident that carbon fiber of highest modulus provides extraordinary rigidity. However, resistance to damage decreases as rigidity increases (higher modulus). Using another example, the carbon fiber slab of maximum rigidity – made from fabrics of highest modulus – will offer less resistance to damage. The more a component is reinforced with fabrics of highest modulus, the more it will be susceptible to breaking during bending. Further analysis will be carried out with carbon fiber of standard modulus, and composites made from fabrics of the highest modulus will provide opportunities thanks to carbon composites. Note that both aluminium and carbon fiber may be used as “hybrids” that impart other performance characteristics to the component. In the case of aluminium, this relates to alloys along with other metals, and in the case of carbon fiber it relates to simultaneous use of aramide, glass, basalt or vectrone fibers. Very common are kevlar and aramid-kevlar-carbon composites that offer rigidity and high resistance to damage, but that will be the subject of another study. Weight is essential for many products. 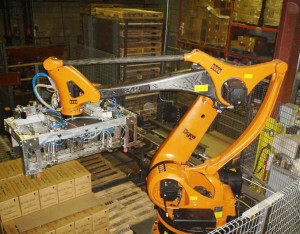 For example, reducing the weight of the arm / catcher of an automated heavy duty machine that works at a speed of 10 m/sec. will enable its speed to be increased and extend its working life. At an industrial scale, it may result in increased production plant capacity and significant savings. Another example may be a wheelchair, where reducing its weight makes it easier to lift in and out of a car and also enables better control. It is very evident in the case of Formula 1 racing cars where aluminium replaced with carbon fiber resulted in reduction of weight, which is crucial in this sport. 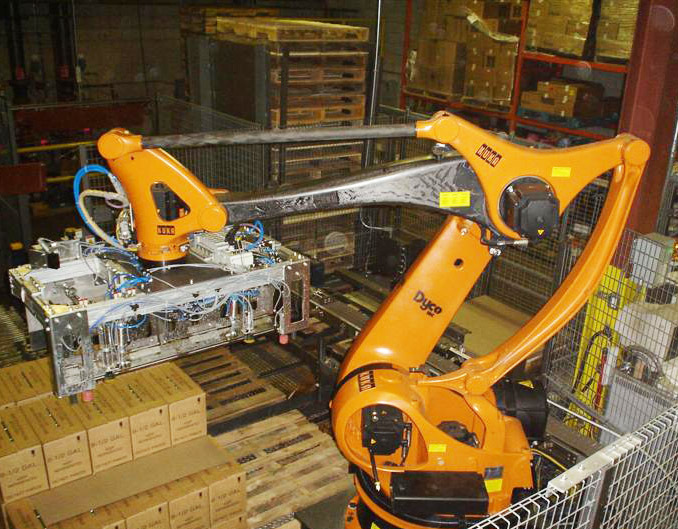 KUKA automated machine arm made from carbon fiber enables increased operating speed and reduces its weight at the same time, which results in reduced loading on bearings and other components subjected to wear. From the comparison of aluminium with carbon fiber we know that material density has a direct impact on its weight. Carbon fiber composite has a density x 2 times less than aluminium, and more than 5 times less than steel. Consequently, in a component of the same dimensions, replacing aluminium with carbon fiber will reduce its weight by 50%. Replacing steel with carbon fiber will reduce the weight x 5 times. To illustrate this, imagine slabs 6mm thick of 1m2 area. 8.7 kg for a carbon fiber sheet. When designing products and at the point of material selection, rigidity shall be taken into account as well as the strength of a given material, as described in sections 1 and 2 of this study. 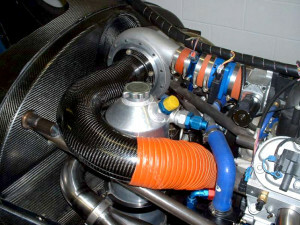 In practice, possibilities regarding component weight reduction by replacing aluminium with carbon fiber required further tests and experiments. Each element relates to an individual case of unique geometry and parameters. Usually it is possible to reduce weight by 30-50 % by using carbon fiber. The carbon fiber car body enabled BMW to reduce the weight of IS model by 300 kg. BMW launched production of complete car bodies made from carbon fiber for their I3 model. The carbon fiber car body enabled them to reduce the weight of each car by 300 kg. Every year, the company manufactures tens of thousands of these cars. Actually more clients are interested in this model than BMW originally predicted. Reduction of weight by use of carbon fiber is possible and advantageous especially for products where directional strength is significant. Unlike metals, composites do not demonstrate identical strength in any direction (not uniform). Actually it is during the production process where decisions are taken regarding the direction of fabrics (when using one-direction fabrics) and the direction that will offer the greatest strength, by reducing strength at other places. This solution makes it possible to reduce the weight of carbon fiber components even further. Carbon fiber due to its low density is a material that may be easily machined with CNC machines or manual tools, including angle grinder or dremel. Carbon fiber is a material that may be easily machined with a CNC machine– photo shows a tattoo machine made from carbon fiber. Although high quality carbon fiber structures produced by the vacuum method (resin infusion, prepreg) may be threaded, where many thread connections are required, special inserts are used instead. Aluminium elements are combined most often by welding, riveting or with inserts. With carbon fiber, gluing is used most often, with reinforcing rivets and inserts if necessary. Modern day epoxy adhesives ensure bonding strength similar to welding. As a matter of interest, Ferrari gradually introduced new technology that replaced welding of aluminium with bonding using epoxy adhesives. At present, Ferrari 458 Italia features 70 m of welds and 8 m of adhesive. The Chief Engineer Ferrari Moruzzi anticipates that in future, due to changed manufacturing processes, car bodies will include more adhesive related bonding than welding. For Ferrari, it is an opportunity to use other aluminium alloys that offer improved performance but cannot be welded. When comparing bonding with welding, note that bonding requires easy technology implementation (although know-how and experience is required). The technology of bonding is widely used in the aviation industry to reduce weight and, at the same time, reduce fuel consumption. However, bonding has some disadvantages, including surface preparation or the time required for adhesive coat bonding. In many cases, the components that may be exposed to impact (e.g. in a car accident) are reinforced with special inserts to counteract the sudden breaking load. Bonding technology will be used more frequently due to development of more powerful adhesives, and through raised awareness of its benefits and possible opportunities. Each material displays different heat expansion characteristics. Heat expansion relates to the change in material dimensions due to temperature change. Carbon fiber, in practice, shows almost zero heat expansion and therefore it is widely used in devices including 3D scanners. 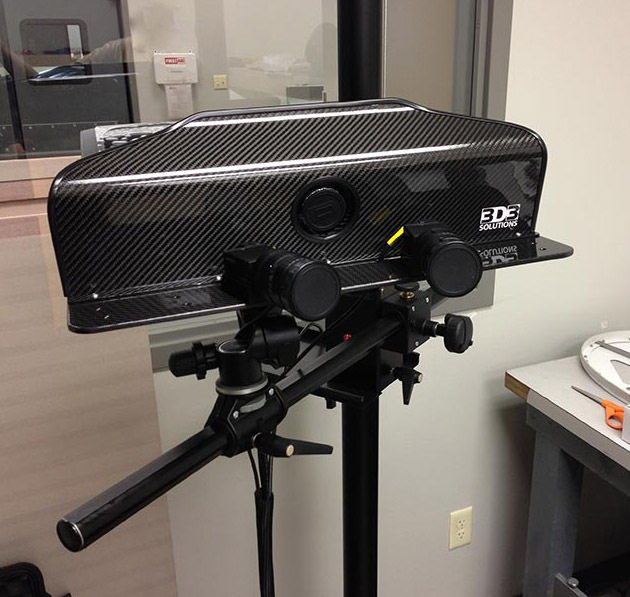 As, in practice, carbon fiber shows nearly zero heat expansion it is widely used in devices including 3D scanners. Design engineers are more and more often convinced by the many advantages that carbon fiber offers due to low heat expansion compared with traditional materials like steel or aluminium. Carbon fiber demonstrates extraordinary parameters in this regard, and it is suitable in particular for high precision elements like optical devices, 3D scanners, telescopes and others where minimal low heat expansion is crucial. Carbon fiber (composite of carbon fiber and epoxy resin) is a material with heat expansion x 6 times less than aluminium and more than 3 times less that steel. The table below includes analysis regarding heat expansion of different materials, considering the ratio of inch/degree Fahrenheit. The specified units are for reference only with regard to differences between materials. Carbon fiber is a material with low heat conduction characteristics. Carbon fiber is a perfect insulator– the above photo shows a carbon fiber turbine inlet. Heat conduction mainly depends on transfer/conduction of energy from areas of high temperature to areas of low temperature. Highly heat conductive materials transfer temperature more easily than materials with low heat conductivity. Composite made from carbon fiber and epoxy resin is a material with heat conductivity x 40 times less than aluminium and 10 times less than steel. Therefore the assumption may be made that carbon fiber is a very good insulator. Aluminium is a material with resistance to high temperatures, and in this regard it offers advantages over carbon fiber composites. Carbon fiber performance and resistance to high temperatures depends on the composite structure and baking technology. It is true that carbon fiber composite is resistant to high temperature, but unfortunately that is often not the case. Actually it results from improper materials, improper baking of the composite or insufficient know-how and experience in this regard by many composite suppliers. To ensure resistance to high temperature, only materials may be used during manufacture that demonstrate such resistance, provided that composite baking is carried out properly in the range of temperatures similar to the desired resistance of the composite. Use of resins resistant to high temperatures, without additional hardening inside the oven, will not provide the required resistance. Standard epoxy carbon fiber composites that underwent proper baking feature resistance up to 70-100 °C (160-210 °F). If resistance is required to temperatures over 100 °C , most often carbon fiber prepreg is appropriate, often along with hardening of the composite at temperatures around 150°C/300°F, which enables improved resistance up to temperatures of 200°C/400°F. For example, Prepreg Gurit EP127 features resistance up to 230°C/445°F. If resistance is required to higher temperature, phenol resins are used and these composites feature momentary resistance up to 500°C/930°F. Although such resistance can be ensured for composites, note that these special materials are costly and require not only hardening in a furnace at high temperature, but know-how as well. Therefore all of this results in a high price for composites that are resistant to very high temperatures. When used for construction, the carbon composite should be manufactured with the vacuum method – resin infusion or prepreg. Such technology ensures long service life of the carbon composite. Carbon composite made manually with “a roller and brush” has poor strength and short service life. Carbon fiber has corrosion resistance, which offers another advantage compared to aluminium. Carbon fiber– epoxy composite has disadvantage that relate to reduced resistance to UV radiation, and therefore the composite exposed to UV radiation should be protected by top coat application, which, as an additional process, makes for higher production costs. Why is carbon fiber is not widely used in production runs although it offers many advantages over very popular aluminium? Most often it is caused by price: carbon fiber elements cost more than aluminium ones because carbon fiber costs more and the manufacture of carbon products is more time consuming. On the other hand, when comparing costs related to implementation of aluminium and carbon fiber production, in many cases it is the production of the carbon fiber element that will be cheaper and, more importantly, affordable in case of a small run, for which implementation of aluminium element production would not be cost-effective. The following movie shows the manufacture of carbon fiber elements using prepreg technology. Finally we need to mention widespread lack of awareness regarding the advantages and benefits of carbon fiber over traditional materials including aluminium or steel. 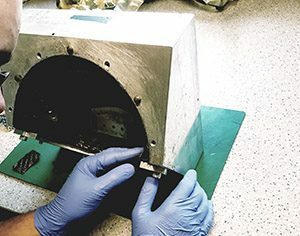 We hope that this paper provides more insight about carbon fiber and what makes this material different from aluminium, as well as what benefits are possible by replacing aluminium with carbon fiber. We hope that this study provided more information on properties of carbon fibre in comparison to aluminium. With time, more and more design engineers will make use of this material, as carbon fiber offers many advantages including light weight, practically zero heat expansion, easy machining and high rigidity. Our company is a supplier of carbon fiber components. We supply custom components, as well as runs of carbon fiber products. Location: Wołomin, Poland (Europe), Worldwide shipping.